This principle is currently widely accepted, and I would say that in guitar making it would be hard to find people who would dispute it. Interestingly, in the same times where this principle was developed, it was considered that “ornament is crime”. For now I only want to expand on how form follows function in instrument making; I will for now not get into a discussion how ornament is criminal. On the Baglama the strings often rub on the headstock, due to how the tuning pegs are located. I felt it was important to eliminate this flaw, but without using guitar tuning machines (quite heavy and unsightly). While using what looks like a traditional friction peg, I adjusted the location of these pegs and also changed the shape of the headstock so that the string would no longer rub and mar the headstock. And also eliminate any danger of buzzing in this area. The only way to change the design of the headstock while using veneering techniques (as outlined on my post “Light as a feather“) was to create angled and curved areas. This angling and curving can be quite ambitious, but it provides incredible strength and doesn’t insult the eye. 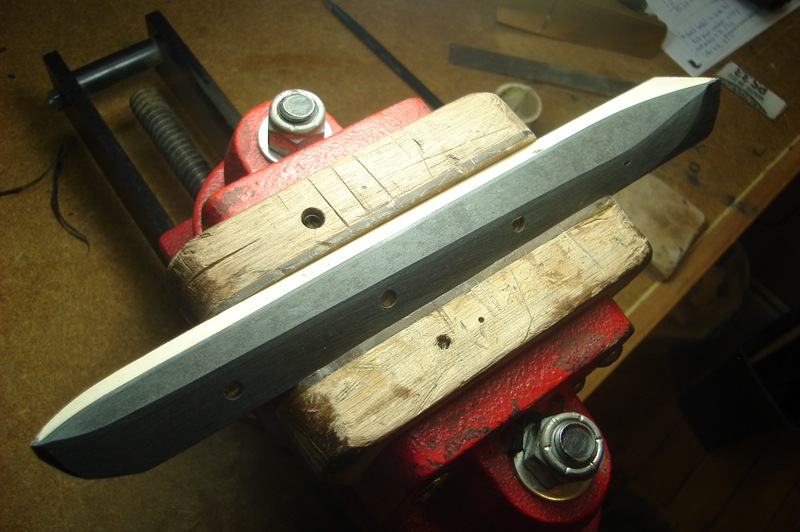 The pictures show the roughly finished headstock of a Baglama, and you can easily see the many angles and curves. I don’t know how many of you out there have a strong affinity for light instruments, but I certainly do. Although my instruments are not as light as a feather (yet), it is something I strive for. In this post I don’t want to bother you with physical acoustic principles and wordy explanations as to why “light and strong is good” in instrument making. 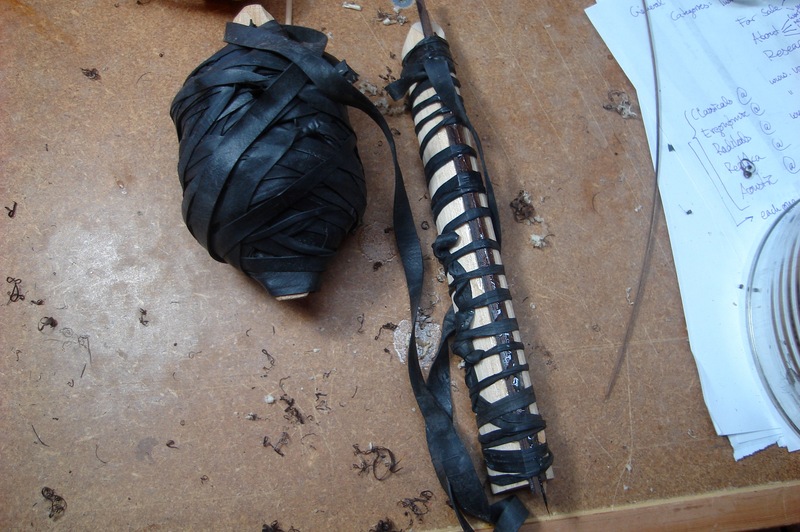 In this post I would like to show you a little example of how I do make some of my instruments lightweight without compromising their stability. The instrument I will show you here is called a “baglama”, which is a Turkish instrument. It may remind you of the lute, but it is strung with steel strings and has a much narrower neck. In many of my instruments, I put special attention to making the necks of my instruments light, so that they rest lightly in the musician’s left hand. An instrument with a light neck has good balance, and feels very light even if the instrument’s overall weight isn’t all that different from conventional instruments. The first concern is always that stiffness or stability may be compromised when building light. One of the techniques I have started to love for making both very light and strong structures is veneering, and it has been the standard in lute making from the Renaissance onwards. Essentially a light wood such as spruce is used as a core, and it gets wrapped in thin sheets of hardwood. The stability comes both from the materials itself and their array (…the “Second Moment of Area” in physics). I have used this technique for lutes, baglamas and recently even a classical guitar, and I am impressed with its strength. 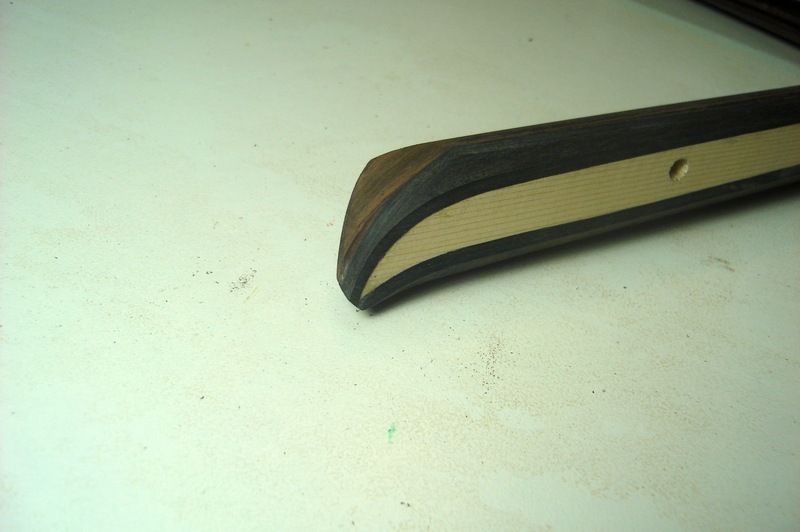 Below is a picture of the baglama head, with two strips of rosewood veneer already glued in place. The rubber band is an excellent tool to clamp veneers to a wood core, especially when it comes to curved areas where no other clamp could stay.